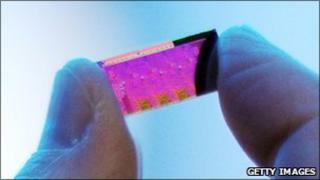 The European Commission says it has given approval for chip maker Intel's proposed $7.68bn (£4.8bn) takeover of data security firm McAfee. Approval is conditional upon Intel making its products compatible with software from rival firms. The deal has already been cleared by US regulators. PC security is a big and growing business, with the threat from viruses and malware, or malicious software, increasingly concerning consumers. "The commitments submitted by Intel strike the right balance, as they preserve both competition and the beneficial effects of the merger," said EU Competition Commissioner Joaquin Almunia. Intel's computer chips are inside 80% of the world's PCs and servers.